Sunshine Coast trains are suspended between Gympie North and Beerwah due to extensive damage at Landsborough station. Buses will replace trains. NOON: SES crews are clearing fallen trees and debris, with almost 130 personnel operating out of the Maroochydore base with more in the Noosa area. Crews have so far responded to 547 calls for help on the Sunshine Coast. Others are manning sites where live powerlines have fallen to ensure all passerby stay clear until Energex can disconnect power. Meanwhile Coast residents are being warned to stay out of the water with 30 sewerage pump stations overflowing today and high amounts of debris around. Swiftwater rescue crews came to the aid of residents trapped in floodwaters in three rescues yesterday. A dramatic rescue at Tanawha brought a baby, mother and two children to safety from a house inundated in 1m floodwaters. Queensland Fire and Emergency Service acting inspector Bernie Massingham said rescuers also retrieved trapped residents at Yandina and Pomona. "Our focus today is really in the northern part of the Sunshine Coast, through the Noosa, Peregian and Coolum areas," Mr Massingham said. "It appears they were hit most heavily by the storm that came through last night." 9AM: MURKY water caused by run off will make beaches close to creek and river mouths less than desirable today but expected heavy surf conditions now look unlikely to arrive until the first days of the school holidays. Lifeguard supervision Anthony King said the swell direction was expected to change to the south east after a strong southerly change kicks in later today. Mr King said the shift would see swell begin to increase on Monday and Tuesday to deliver solid waves on all Coast beaches. Size would depend on how far south the swell direction was with the chance it may march straight past the region. Surf at Maroochydore Beach this morning was brown, Mr King said, with Kings Beach, Currimundi, Kings, Noosa and Mooloolaba also affected. 36,000 properties without power: How long to fix it? "All other beaches will be fine," he said. "It's up to each lifeguard to determine whether their beaches are to be closed or open." The Bureau of Meteorology said the south westerly conditions would turn more southerly later in the day with a gale warning remaining that would decrease to a strong wind warning on Saturday. Winds to 74 kph can be expected offshore this morning then easing off tomorrow. A strong wind warning will continue but conditions would ease off a lot. 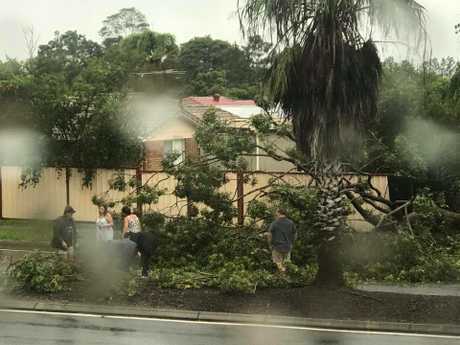 Destructive wind gusts to 90kph and in excess of 125kph may still occur today but Bureau of Meteorology forecaster Nicholas Shera said it was more likely they would occur south of the Sunshine Coast. "The tail end of ex-Tropical Cyclone Debbie over water has become more intense," he said. The system will move slowly east away from south east Queensland over the next few days. He said more powerful surf would develop with the potential for erosion of open beaches. UPDATE FRIDAY 8.20AM: A WARNING remains for damaging wind gusts on the Sunshine Coast which may reach a peak of 90kph in places with destructive wind gusts, in excess of 125 km/h, possible about the coastal fringe and islands of the Southeast Coast district during this morning. The Bureau of Meteorology says affected locations may include the Sunshine Coast, Brisbane, Gold Coast, Gold Coast Hinterland, and the Scenic Rim. More than 36,000 homes are without power this morning after almost 300 power lines came down in yesterday's ferocious winds. All Sunshine Coast schools are still closed today. 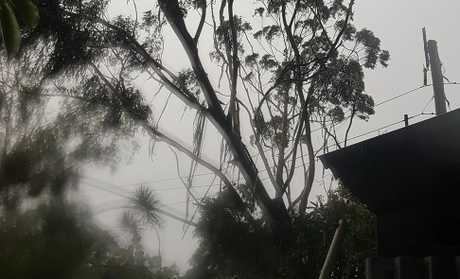 A tree rests against powerlines after a storm ripped through the Noosa hinterland. Flooded roads across the region are still a danger, with forty-five roads closed due to flooding as of 6.30am. Dangerous surf conditions are expected about the Queensland coast south of Sandy Cape. As at 4 am the centre of Ex-Tropical Cyclone Debbie was located offshore from the Gold Coast, and was expected to strengthen off the northern New South Wales coast during today as it moves towards the southeast. An area of gale force winds will extend along and near the coast south of Double Island Point, and winds offshore may reach storm force intensity south of Cape Moreton. As the clean up on the Sunshine Coast gets underway today after last afternoon's 108kph last blast from ex-tropical cyclone Debbie the Sunshine Coast Council has opened its resource recovery centres for free green waste disposal delivered by private domestic vehicles today and across the weekend. Sunshine Coast Local Disaster Management Group co-ordinator Andrew Ryan said the free green waste disposal would help residents clean up their properties. "There is a lot of vegetation down and small debris around, so we encourage residents to dispose their green waste at no charge today and on the weekend," My Ryan said. "We will reassess the free disposal arrangements before Monday to determine whether these will continue after the weekend." The free disposal is available for utes and trailers only. Dangerous surf conditions are likely to produce significant beach erosion over coastal parts of southeast Queensland south of Sandy Cape the BOM advised. Abnormally high tides are likely about beachfront areas south of Cape Moreton on the high tides during today. Although conditions were offshore and clean on Sunshine Coast beaches early this morning with only minor sand movement the BOM advises impacts may be felt here later in the day. Surf Life Saving Australia recommends that you stay out of the water and stay well away from surf-exposed areas. UPDATE 6.20PM: Strong winds are buffeting Mooloolaba, bringing down trees and light poles on The Esplanade. The street has been completely blocked in both directions after the massive tree came down near the beachfront caravan park at the northern end of the road. Roof sheeting pulled from an awning on the Mantra building is flapping like paper with each gust. Dozens of apartment buildings are blacked out, after wind gusts brought down powerlines across the Sunshine Coast. UPDATE 6PM: TREES have crushed cars in Noosaville as a last savage blast of gale force wind struck the region leaving tens of thousands of homes without power, closing roads and bringing down powerlines. Noosa Disaster Management coordinator Alan Rogers has warned people to stay indoors because of the danger from flying objects and live powerlines on the ground. The wild conditions have left more than 9500 homes without power in Noosa Shire across 12 areas including: Noosa Heads, Noosaville, Tewantin, Sunrise Beach, Cooroibah, Boreen Point, Cootharaba, North Shore, Lake MacDonald, Cooroy and Marcus, Peregian and Castaways Beaches. Strong winds exceeded 60 kph with gusts up to 90kph between 5pm and 6pm ripped branches from trees or felled them, some falling across power lines. Cr Joe Jurisevic, Chair of Local Disaster Coordination Centre said power lines were down in various parts of the shire with a number of roads flooded. "Police are warning residents to stay indoors and avoid driving," Cr Jurisevic said. Wind speeds to 108kph were recorded at the Sunshine Coast Airport as heavy rain falls on a narrow band along the coastal fringe. The conditions have closed Beckman Road, Walter Hay Drive, the Weyba Noosa Road, Griffith and Sea Eagle Streets and St Andrews Drive as well as Sivyers, Moorindil and Butler streets, Gympie Terrace and Coral Tree Street in Noosa Heads, Noosaville and Tewantin. Crews are out already clearing power lines. "Conditions are very dangerous," Mr Rogers said. Sunshine Coast Disaster Management Centre coordinator Andrew Ryan said wide spread damage was expected across the Sunshine Coast Council area. Field crews are in action now clearing trees and vegetation from roads. The Bureau of Meteorology says the winds now being experienced are the strongest recorded during ex Tropical Cyclone Debbie's descent through the region before it passes out to sea. Forecaster Michael David said any rain after the current burst at 5.30pm would be the last clearing remnants of the extreme weather event. The extreme gale force winds came after a day when the airport had managed to get all schedule flights to that point onto the ground and into the air. A low pressure system is expected to maintain off the south east Queensland coast through the weekend generating big season beaches from Caloundra to Noosa. Mr Michael warned wind gusts would continue to hammer the region but are not expected to exceed current levels. UPDATE 5.40PM: Winds are being recorded at 108kmh at the Sunshine Coast Airport as heavy rain falls on a narrow band along the coastal fringe. 5.30PM: The Bureau of Meteorology warns that, at 5.10 pm, very dangerous thunderstorms were detected on the weather radar near the area southwest of Noosa Heads, the area west of Noosa Heads and the area south of Noosa Heads. These thunderstorms are moving towards the southeast. Very dangerous thunderstorms are forecast to affect Maroochydore, Caloundra and waters off Maroochydore by 5:40 pm and waters off Bribie Island, northern Bribie Island and Beerwah by 6:10 pm. 5PM: The Bureau of Meteorology warns that, at 4.50pm, severe thunderstorms were detected on the weather radar near the area northeast of Gympie. They are forecast to affect the area north of Noosa Heads, the area east of Gympie and Lake Cooloola by 5:20 pm and Noosa Heads, waters off Noosa Heads and the area northwest of Noosa Heads by 5.50 pm. There are currently more than 15,500 homes and businesses without power across the Sunshine Coast. A storm warning issued by the Bureau of Meteorology. 4.20PM: Floodwaters at Nambour have receded since this morning despite rain continuing through the day. Debris has been caught on foot bridges over Petrie Creek, and below the deck below the swollen creek is still flowing swiftly. Michele Cipriani was in Quota Parkthis morning and was surprised to see the levels had gone down when the forecast was for the situation to worsen. "You couldn't go over that bridge before," he said. The aftermath of flash flooding in Maroochydore. At Woombye sticks and branches dot the roads, and wheelie bins have been blown over by strong winds. A powerline has come down at Eudlo and in Palmwoods the soccer fields remain flooded and one road is closed. But the extreme weather buffeting the Sunshine Coast has not put off some thrill seekers. Kite surfers are braving driving rain , strong wind gusts and choppy conditions in the Maroochy River mouth at Cotton Tree. One surfer was lifted at least three metres above the waters surface. Back in Quota park Kelly Collier and 10 family members hit the park for a game of volleyball. "It's fun we're all from New Zealand so that's what we do, we play in the rain," she said. 2.20PM: WILD weather has forced the council to open an evacuation centre for those who require emergency shelter. Caloundra Indoor Stadium is the primary evacuation centre, with bedding and Red Cross staff available. Maroochydore Basketball Stadium has been placed on standby as a secondary place of shelter, if needed. The State Government has directed that all Sunshine Coast schools will remain closed on Friday, March 31. 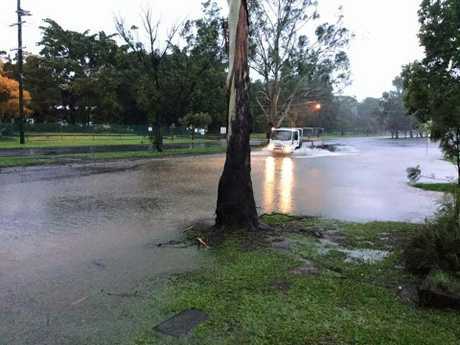 1.30PM: EVACUATION centres have been placed on standby at Caloundra Indoor Stadium and Maroochydore Basketball Stadium (Elizabeth Daniels Park) in case of flash flooding later this afternoon. Local Disaster Management Group (LDMG) Andrew Ryan said flash flooding was expected to increase through to this evening. He has urged motorists to avoid any unnecessary travel with 49 roads already closed, Bradman Avenue, Maroochydore likely to go under early this evening and the Department of Transport and Main Roads closely monitoring the Bruce Highway at King Johns Creek north of Caboolture. Sandbagging operations have been scaled back to Nambour/Woombye SES depot only, with limited supplies remaining. SES crews are now responding to emergency situations and have already answered 136 requests for assistance. Scenes from a flooded Sunshine Coast: Flooding across the Sunshine Coast: motorists ignore "flooded, forget it" message, kids enjoy puddles, and dams overflow with heavy rainfall. "We already have roads closed and more are likely to close, with further flash flooding very likely when the heavy rainfall comes through this afternoon," Mr Ryan said. As the low pressure system moves through Wide Bay Bureau of Meteorology forecaster Nicholas Shera said the system now appeared to be travelling more quickly than anticipated. If that continues to be the case he said it then move out to sea around 7pm. Mr Shera said an intense rain band was around the low over Wide Bay at around noon which would then see the worst of the weather arrive on the Sunshine Coast earlier than expected. UPDATE 12.30PM: A swiftwater rescue is underway at Tanawha where a family of six is stranded in a flooded house. Emergency services are at the scene helping to rescue the two adults and four children. Emergency services are also preparing for a serious risk of flash flooding at Noosa, which has been hardest hit by heavy rain. The region's major shopping centres have both closed their doors for the day. Sunshine Plaza and Kawana Shoppingworld are expected to re-open in the morning. UPDATE 11.30AM: A severe weather warning has been issued for the Sunshine Coast as destructive winds begin to buffer the south east and heavy rain intensifies. At 10am ex-Tropical Cyclone Debbie was just south of Rolleston and expected to continue moving south east over the southern parts of the Central Highlands before tracking over southeast Queensland during the afternoon and evening. Sunshine Coast Council has elevated the region's disaster management group to the highest level ahead of what is expected to be the peak of the storm system's fury which is set to start about 2pm. A council spokesman said the Local Disaster Management Group Control Room has been activated about half an hour ago and the group is on 'stand-up', the highest level of alert which is effectively incident response. The system is expected to then move off the far south east Coast overnight into Friday morning. The Sunshine Coast's biggest shopping centre will close from noon today ahead of an escalation in extreme weather conditions this afternoon. Sunshine Plaza Centre manager, Michael Manwaring, said the closure would allow staff to travel home safely. "The safety of our customers, retailers and staff at the Centre is our number one priority and we encourage everyone to take the necessary action to be safe during this time," Mr Manwaring said. At this stage the centre will resume normal trading hours from tomorrow. Heavy rain is being generated with widespread 24-hour totals of 150 to 250 mm are expected, with significantly higher levels possible locally. The focus for heavy rain will continue in far south east parts of the state for the rest of the day with isolated very heavy totals in excess of 400 mm possible, mostly around the higher ground in southeast Queensland. The Bureau of Meteorology warns the rainfall was likely to lead to major river flooding over a broad area and a Flood Watch is current for coastal catchments between Hervey Bay and the NSW border, extending inland to parts of the Maranoa and Warrego, and Darling Downs and Granite Belt forecast districts. The most likely area for damaging wind gusts will move south along the coast during the rest of today with destructive wind gusts, in excess of 125 km/h possible about the coastal fringe and elevated terrain on the Sunshine Coast and in Wide Bay and Burnett. 10AM: RESIDENTS in the Coolum hinterland have been left stranded on their properties since this morning, after heavy rain broke the banks of two dams. Isabel Noeth, who lives on North Arm-Yandina Creek Rd, said water was flowing over the driveway and she was unable to leave her home. She said she was fortunate enough to have stocked up on provisions, and was happy to keep "sitting still" as the rain poured down outside. Coolum floodwaters: Floodwaters leave Coolum residents stranded. UPDATE 9.15AM: Destructive winds to 125kmh are now certain along the Sunshine Coast coastal fringe this afternoon as the impact of ex-Cyclone Debbie intensifies over the region. Damaging winds to 90kmh are already being experienced but will become stronger this afternoon. The Bureau of Meteorology says vehicles should be moved under cover but away from trees and people should seek shelter indoors. BOM forecaster Nicholas Shera said intense flash floods should be expected as the rain intensifies through the day and into tonight. "A train of heavy rain is tracking from north to south and we are expecting more later tonight," Mr Shera said. A crash on the Bruce Hwy near Mooloolaba. He said the predicted interaction between the tropical low from Cyclone Debbie and a cold air mass moving up from the south was happening now. The good news is that an upper level trough from the west would push the intense weather system out over the ocean sooner than previously thought. Conditions will begin to clear tomorrow ahead of what may be a calmer weekend. 8.15AM: Sunshine Coast residents are being urged to avoid unnecessary travel with the region being smashed by an extreme weather event. 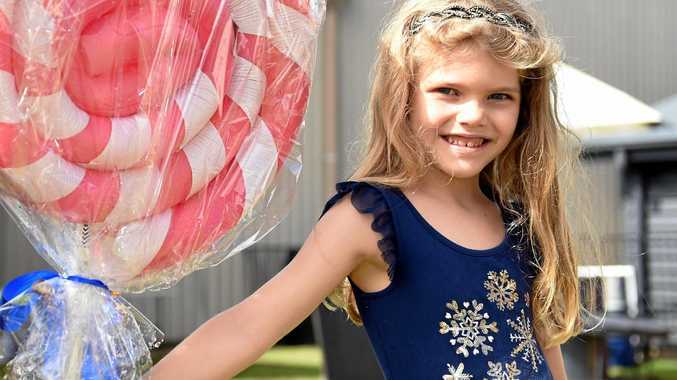 The State Government has directed that all schools in the region are to be closed today, with parents asked to collect their children if they have already been dropped off at school. All beaches across the Sunshine Coast have also been closed. Sunshine Coast Local Disaster Management Centre head Andrew Ryan said the region was in for a big day and night. "Latest forecasts suggest we will see intense hinterland rainfall and localised flash flooding," he said. Wappa dam overflowing : Wappa Dam overflowing this morning. Video taken by Angie Brokenborough. A low tide this afternoon would allow water to clear from some low lying coastal locations but the situation would worsen with the approach of high tide at 10.04pm tonight. In Noosa disaster coordinator Alan Rogers said this afternoon would see conditions worsen with falls above 300mm to cause flash flooding. "The biggest issue will be people doing silly things and getting into trouble," he said. "This is a big system with a lot more moisture in it." Mr Ryan said group had moved to 'stand up' level, meaning it had activated to assist where needed. "We're expecting 200mm of rainfall across the region, with areas in the hinterland expected to receive 400mm or more this evening," Mr Ryan said. ""With that level of rainfall, flash flooding is very likely so people need to be prepared and be careful to check for road closures on our Disaster Hub website. "Destructive wind gusts are also very possible and it's likely there will be a storm surge of 500mm, with localised tidal inundation possible tonight. "If travel is unavoidable, remember to never drive through flood waters and make sure children do not play near flood waters - these are the two most dangerous things you can do in flash flooding events." Avoid unnecessary travel on Thursday, due to expected hazardous road conditions. If travel is unavoidable, remember to never drive through flood waters. Further updates will be issued as required, until the weather system no longer poses a threat to our region. 7:30AM: Sunshine Coast roads are going underwater as the region begins to feel ex-tropical cyclone Debbie's wrath. The now low-pressure system isn't due to hit the region until later in the day, but last night's constant downpour has already made road conditions dangerous. Flooding has been reported on Pioneer Rd at Yandina and the Woombye Palwoods Rd at Palmwoods. Traffic lights are also malfunctioning at Nambour on National Park Road, but it is unclear whether this is weather-related. One school has so far been closed. There are reports of traffic chaos on the Bruce Hwy. 6.24AM: THE worst is yet to come. That is the clear message from the Bureau of Meteorology after up to 172mm of rain fell on the Sunshine Coast overnight with ex-Cyclone Debbie still in the Central Highlands coalfields and not due to hit the region until later in the day. A severe weather warning is still in place across much of Queensland this morning, stretching from Proserpine to the Gold Coast. Forecaster Dean Narramore said there would be wide spread heavy rain across the Sunshine Coast with gale force winds to 54kph already being felt. Coastal areas should expect damaging to destructive winds at and above 90kph later today with the chance of reaching 125 kph. Rain forecast as a result of the aftermath of Cyclone Debbie. "It's going to be a very wet day with a lot of rain still on the way," Mr Narramore said. Twenty four hour rainfall totals will exceed 300mm and potentially hit 400mm in places. Beerburrum with 172mm has felt the brunt of falls to date with other hinterland areas around Peachester recording 148mm and Diamond Valley 150mm. There were falls of 40-70mm along the coast from Noosa to Caloundra with rain to become heavier through the day and into the evening. Seas are also expected to rise throughout the day threatening low lying coastal areas on tonight's high tide at 10.04pm. Residents across the Sunshine Coast Council region who fear inundation are urged to collect sandbags from the following locations today. The council distributed more than 5300 pre-filled bags on Wednesday with new stock available by 9am.